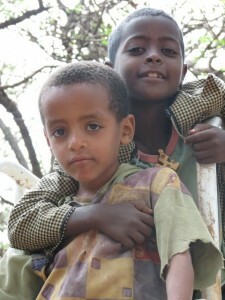 A sweet moment between beneficiaries of CFTC’s work in Ethiopia (April 2012). On day two of her Ethiopia monitoring visit, Amboka Wameyo, CFTC’s new Regional Program Manager-Africa, sat down with CFTC partner Emmanuel Development Association (EDA) and its VERY enthusiastic Executive Director, Tessema Bekele, for a briefing session just before heading out of Addis Ababa for partner visits. I had the opportunity to spend time with Tessema in April and his passion and commitment to improving the lives of Ethiopian children is hugely inspirational. CFTC has enjoyed a long and strong relationship with EDA, and through our work together we are bringing community-led innovation and collaboration to life. We are very excited that they will be a key contributor as we build our Roadmap to Change to deliver long-term impact to children and communities in Ethiopia. 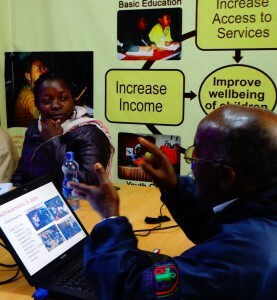 Amboka Wameyo, CFTC's Regional Program Manager-Africa listens during a briefing session with EDA's Executive Director Tessema Bekele. These were the words of Tessema Bekele, Executive Director of CFTC’s partner Emmanuel Development Association (EDA), spoken during the first briefing meeting I attended at the start of my Ethiopian adventure. A CFTC partner since 2006, EDA has proven to be fully committed to improving the well-being of children. EDA’s interventions are concentrated at the community level in Ethiopia’s Central and Amhara Regions to the north of Addis, and are developed and managed jointly with community members. As I reflected on EDA’s commitment to learning, I realized that this commitment is a necessary step in the theory of change process (our Roadmap to Change) that CFTC is initiating jointly with its partners here in Ethiopia in September, and the big reason why I’m here in Ethiopia so soon after joining the organization. A willingness to embrace learning requires both courage and humility, as we confront our assumptions, take ownership for our accomplishments and work together to take a new – and sometimes unknown – path forward. 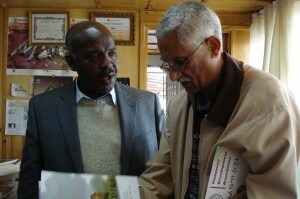 Tessema Bekele (L) of EDA and Gebriel Galatis (R), CFTC's Country Representative in Ethiopia: a long-standing partnership to help Ethiopia's children. CFTC will be working with partners like EDA and others to identify those strategies and processes that will lead to change in the lives of children in Ethiopia and that consequently will lead to long-term, sustainable impact. EDA has already done some of this thinking for its own strategic process. In the spirit of continuous learning, EDA is working with CTFC to align with the Roadmap to Change we are developing globally, which will guide CFTC’s future programming in Ethiopia. Exciting times for the organization and all of our key stakeholders, as we move forward ‘ahead of the curve’ using these best-practice development methods. I am really looking forward to seeing how we can apply the learning of Tessema and others in the days ahead as we create a new future together.